We went on a night dive 3 miles off the coast of the big island of Hawaii. Sea creatures came up from the depth of the ocean. The dive is called "Pelagic Magic". They were transparent and glowing and many looked as if they had neon lights inside of them. 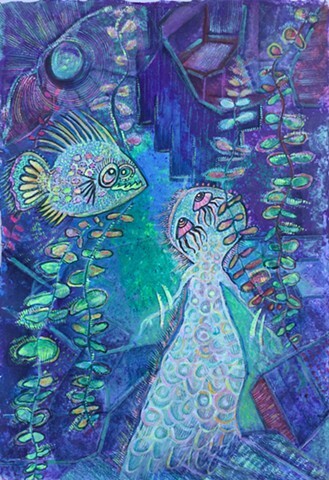 This work is inspired by the mysteries of the deep ocean at night and the wonders of children who dream of their views of reality, and keep us all guessing.